Planning Meeting: Our meeting to plan this year’s Augusta Birding Club Christmas Count is: Thursday November 21st, 6:00 to 7:15-ish PM, West meeting room – Viles Arboretum, 153 Hospital Street, Augusta. The purpose of the 11/28 planning meeting is to review the big CBC circle map, assign territory leaders, discuss teams, and review CBC procedure. In case of need to postpone, see alternate dates. Second alternate date is: Sunday, December 29, 2019. The Augusta Birding Club has been participating in the Christmas Count since 1970, typically finding over 5000 individual birds and 50-55 species on Count Day. Since 1970, the Club has counted over 275,000 birds. Thanks to everyone who participated in the Augusta Christmas Bird Count on December 16 and special thanks to Cheryl Ring for her great CBC organizing. Thirty-two of us walked 32 miles and drove 725 miles, looking for birds within 7.5 miles of the Statehouse dome. The species total of 53 on count day was about average. We also had two count-week species, Barred Owl and Great Blue Heron. We had a couple new records for high counts and several species had much higher than average (count has been going since 1970). Species such as Eastern Bluebird and Red-bellied Woodpeckers continue to increase in our area in the winter. 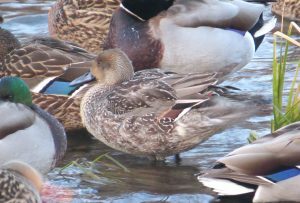 There were low numbers of a couple duck species likely because of the low amount of open water. For irruptive birds, we had a lot of Bohemian Waxwings and some Pine Grosbeaks but no Evening Grosbeaks or Common Redpolls. Rare or unusual sparrows for our CBC included White-Crowned, Chipping, and Fox. See all the numbers and counts below the next section. Complete list and numbers: Count Summary Report 2018, the column “Number” in the checklist part of the PDF is how many of each species we saw this year. The column “Max Number” refers to the entire 1970-2018 period for the Augusta CBC with the first number being the maximum recorded and the second number being the count year (2018 is Audubon count year 119). The “# Of Counts” column refers to the number of years that each species has been seen in the Augusta CBC (49 would be every year). 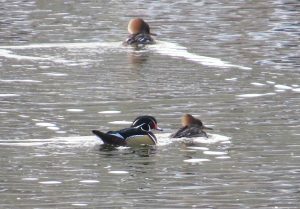 Since 1970 the Augusta Birding Club has counted all birds we can find in one day near Christmas, as part of Audubon’s large international effort. Currently 30+ Birding Club members count birds in a 7.5 mile radius around the State House Dome. It’s amazing what’s out there when you look; we typically find 5000+ individual birds of 50+ species. We have counted almost 300,000 birds since 1970.